Visiting London with the family? London is an urban delight. However, I’ve found that our family enjoys travel the most when we balance a city’s museums and culture with the beauty of the outdoors. So, our family extended our time in England after visiting London by planning a road trip in the UK. We spent a week driving the British countryside on our UK road trip route including the Lake District, England, and Northumberland. I planned a road trip in the UK that included some of the popular things to do in the Lake District, England and Northumberland Coast. In the Lake District, England, we enjoyed taking a boat cruise on Ullswater, walking to the Aira Force waterfall, and having tea in the quaint town of Pooley Bridge. Another highlight of our UK road trip route was exploring the Alnwick Castle and Garden in Northumberland, England. At Alnwick Castle, we took the Harry Potter flying course where some of the movie filming took place. This UK road trip route gave my family something new to explore every day. As soon as we hit the road on our UK road trip route, the weather turned from a summer heat wave to rainy and cloudy. Thus, we got to experience classic British weather. We quickly learned to enjoy tea and scones at every possible opportunity. My 9-year-old daughter is now a tea drinker. However, my 8-year-old son still prefers hot chocolate. Due to the climate, families traveling in England will need to be flexible. The day I had planned to explore the Northumberland Coast turned out to be quite rainy. Instead, we headed for Scotland, which amazingly had a slightly drier forecast that day. 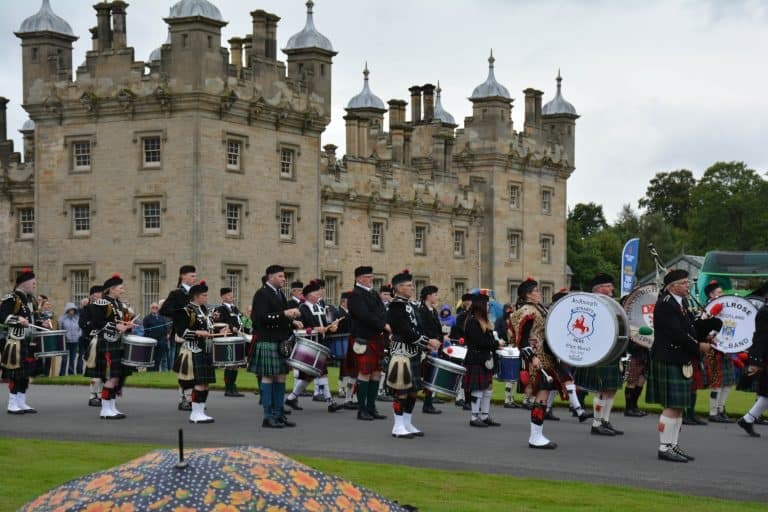 By being flexible on our planned UK road trip, we enjoyed a Scottish bagpipe festival at Floors Castle. Listening to dozens of bagpipes play together on the parade grounds is something that my family will never forget. What a fortunate last-minute change to our UK road trip route! Planning a road trip in the UK? We planned to start and finish our UK road trip route at London Heathrow. The city of York is just about 4 hours from London Heathrow by car making it the perfect first stop. Families visiting York will not want to drive all the way into the city. Instead, drivers should plan to identify a Park and Ride lot where you can park your car and take a bus into the city center. We parked our car at the Askham Bar Park and Ride. About 20 minutes later we were in the historic center of York. Note: The traffic exiting the city at rush hour might cause the bus ride back to the Park and Ride to be much longer than 20 minutes. I wish that we had planned multiple days in York, England on our UK road trip. Still, an afternoon wandering around York is better than missing the city altogether. In our limited time, we ate lunch, wandered the streets of the historic city, appreciated the beautiful stained glass at York Minster, and learned the history of chocolate at York’s Chocolate Story. 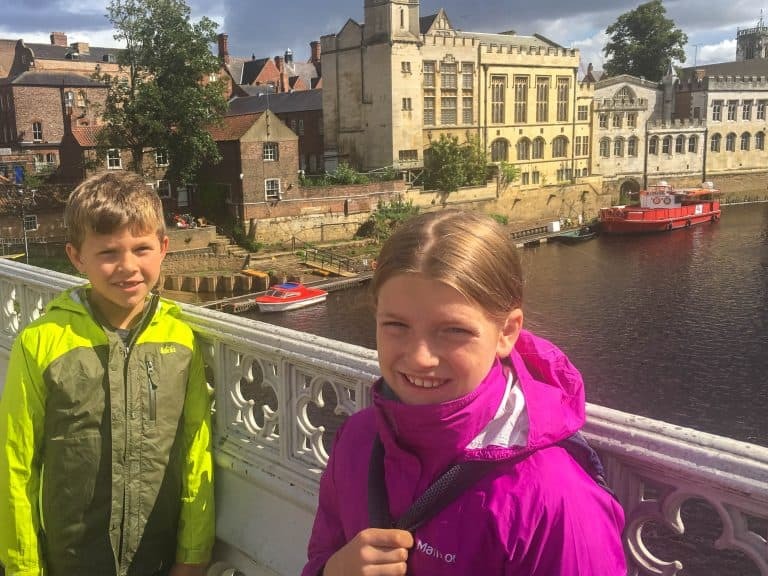 Unfortunately, on this visit, we missed out on walking the York City Walls, the York Castle Museum, the Jorvik Viking Center, and the National Railway Museum. York Minster is the second largest Gothic cathedral in Northern Europe. The current stone building dates from the 13th Century. However, there is history of a church on this site dating back much further to AD 627. 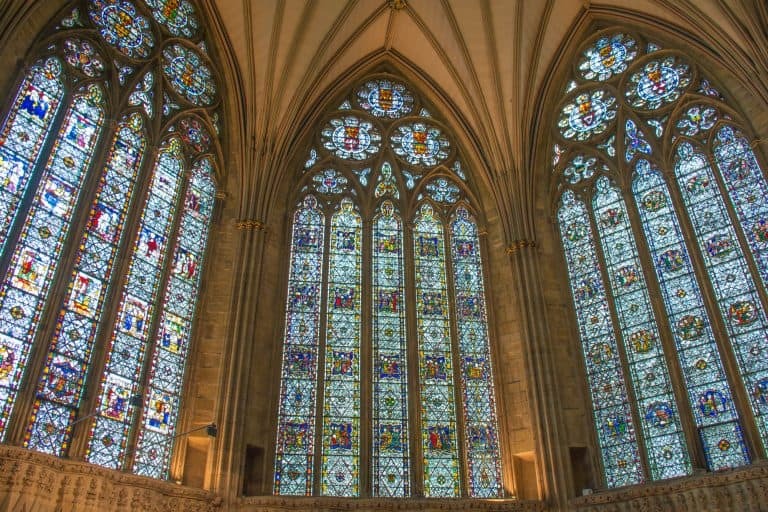 One of the most notable of York Minster’s many beautiful stained glass windows is the rose window. Families will see white roses all over York as it is a symbol of the House of York. The window with red and white roses dates to the early 1500s and marks the union of the royal houses of York and Lancaster to form the House of Tudor. 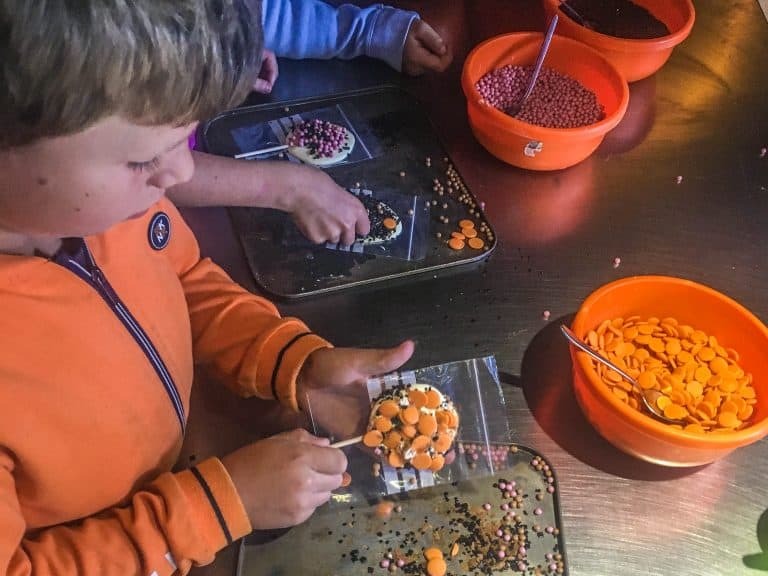 Families are warmly welcomed at York Minster, which is still a place of worship today, making this one of the best things to do in York with kids of all ages. Little ones can check out backpacks from the ticket booth with activities including binoculars, a flashlight, and a magnifying glass. We saw most of the young children in line being greeted and given backpacks as their parents purchased tickets. 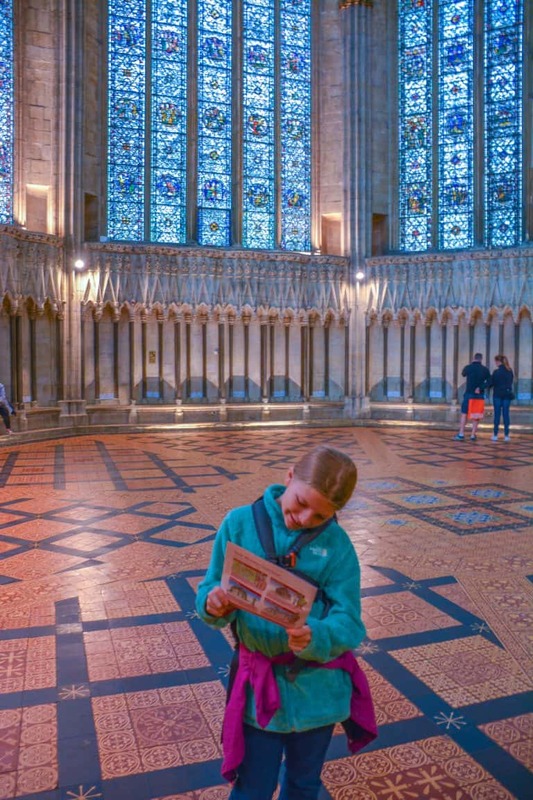 Older children can use the “treasure map” to guide their visit to York Minster. The map has nine symbols scattered across an illustration of the inside of the cathedral. Children can find everything from a dragon to the 750-year old Five Sisters window using the map. My family wasn’t sure about what to do with our short time in York on our one week trip to England. However, once we read about York’s Chocolate Story, it seemed like the perfect fit for us. The modern, guided, interactive experience is about an hour long. Tickets must be purchased for a specific tour time. The tour uses multimedia to tell the story of York’s history in the chocolate business. Tour guides are enthusiastic as they describe the popularity of York’s Kit-Kat bar across the globe. Throughout the tour, visitors are given pieces of candy from various eras of York’s chocolate-making history. These treats keep the kiddos quiet and entertained. At the end of the tour are a small, modern museum and an experience where visitors get to make their own chocolate treat. Our family spent the night in Scarborough at the Kimberley Seafront Hotel, a classic British bed and breakfast. 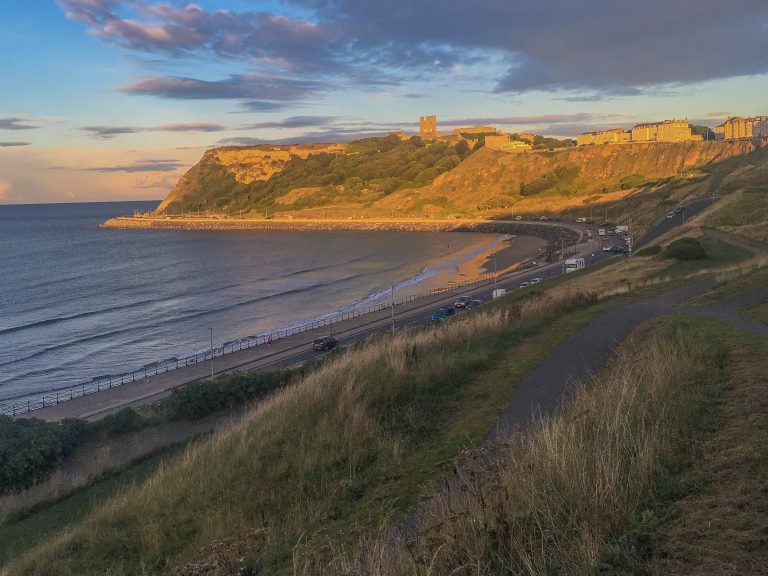 Scarborough sits on the coast with a long stretch of sandy beach in the shadow of the three-thousand-year-old Scarborough Castle. The hill top castle is now one of many historic sites across Britain managed by English Heritage. From Scarborough, our family drove north across the moors to North York Moors National Park. We drove twisty country roads across the moors covered in flowering purple heather. The roads passed through small towns with even narrower streets. Planning a road trip in the UK? 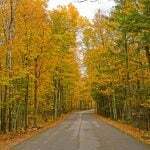 You’ll want to make sure that you get off the highways and into the small town. 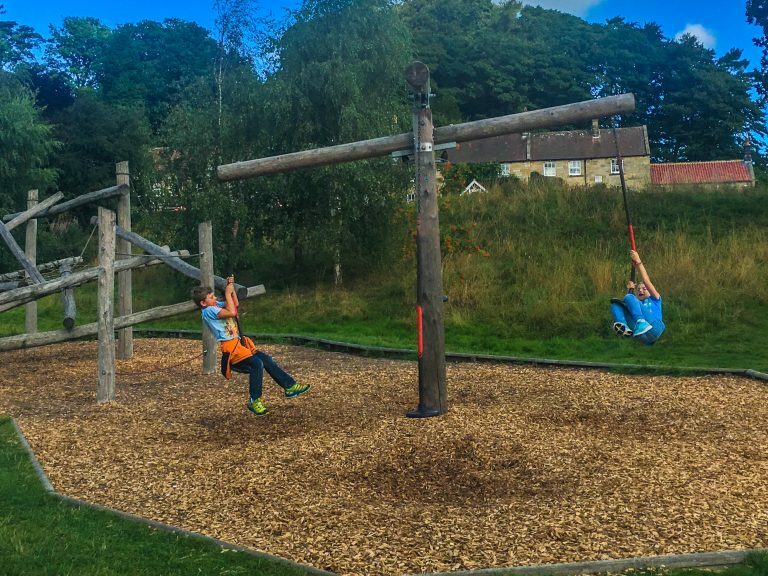 The Moors National Park Visitor Centre in Danby has some fun, free indoor exhibits, and outdoor play areas. Indoors we found a children’s play area that included a cute climbing wall that my 8-year-old had almost outgrown. There were also interactive exhibits showing the wildlife in the area. Outdoors we found a playground, including a mud kitchen for tots and a fun labyrinth. There were also short walking trails designed for young children, statues that told the history of the area at a touch of a button, and a large wooden dragon sculpture. Our favorite was the free Woodlings of Crow Woods House Spotter Trail scavenger hunt featuring tiny houses. Due to holiday weekend traffic, we passed up a visit to the ruins of the popular Whitby Abbey, another heritage site, perched on the headlands high along the North Sea. Instead, we spent a couple hours exploring the small town of Staithes. There are several small seaside towns in this area of Britain worth exploring. Many have museums celebrating the life of Captain Cook, a North York Moors native. In most cases, the streets in these towns are narrow so it is best for families to plan park outside town on their road trip in the UK. Typically, there is a well-marked parking area which might require a small hourly fee. From the parking area in Staithes, it is a short 10-minute walk downhill into this historic fishing village where we found access to the beach and restaurants serving fish and chips. 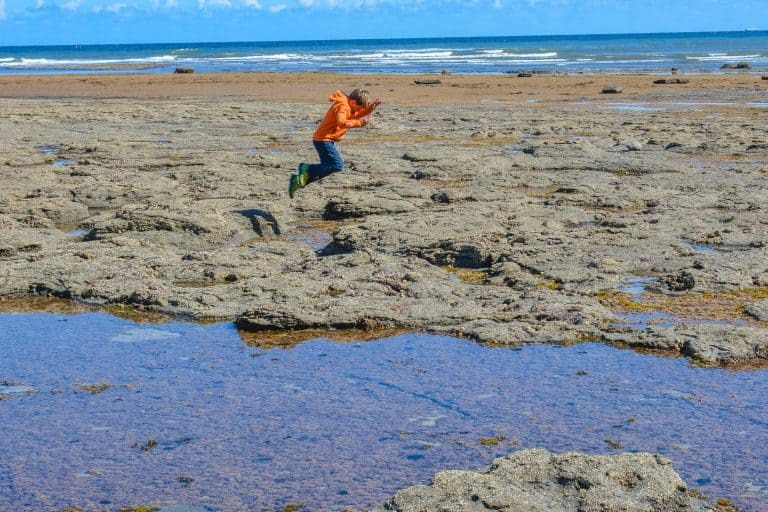 Children love walking or hopping along the rocky coastline near Staithes at low tide. There are creatures in the tide pools. Adults will appreciate the coastal views with some of the highest cliffs on England’s east coast. 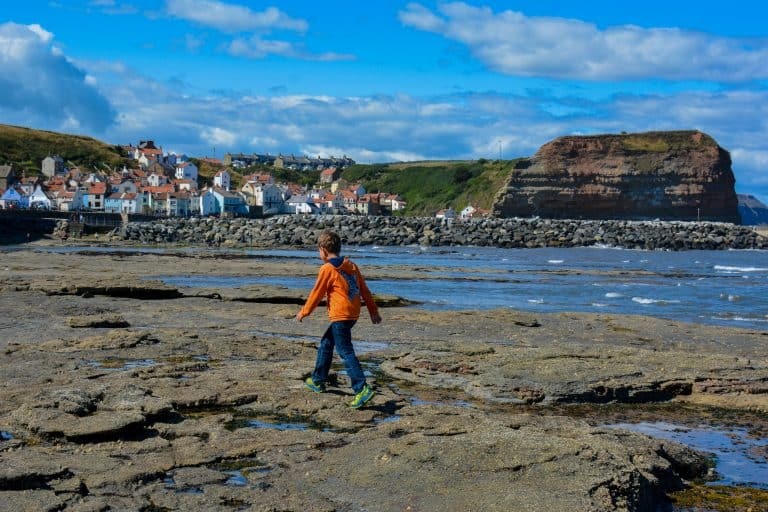 For families looking for a longer hike on their trip to England, the Cleveland Way National Trail can be accessed in Staithes. The tidal range in this region is huge. As we arrived at the beach in Staithes, fishing boats were sitting on the bottom of the harbor. When we left only an hour or so later, they were afloat in several feet of water. Do be cautious of the quickly moving incoming tide. Our family found a quaint tea shop across the street from the parking lot in Staithes. The homemade desserts were particularly yummy, some of our favorites on our trip to England. 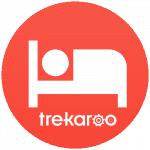 Look for deals on family-friendly hotels in York. 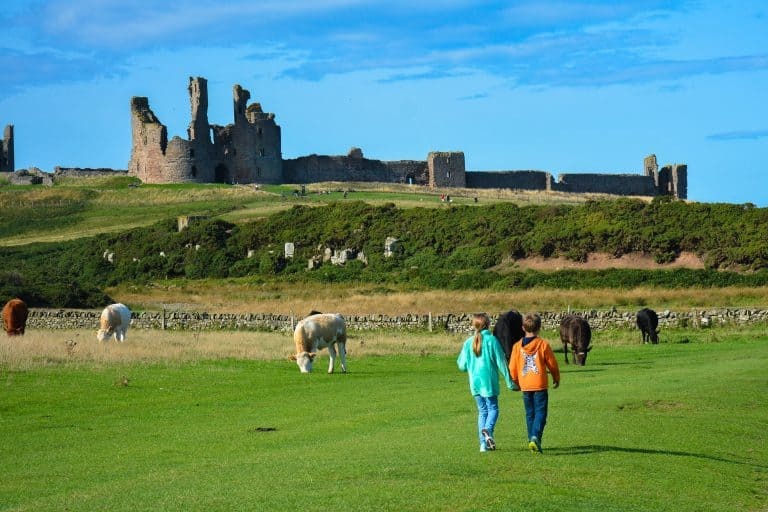 We quickly continued onwards to Dunstanburgh Castle to make the most of our sunny day in Northumberland, England. Again, there is a large parking area just outside the town of Craster. From the parking area, families walk about 30-45 minutes to the ruins of the castle. 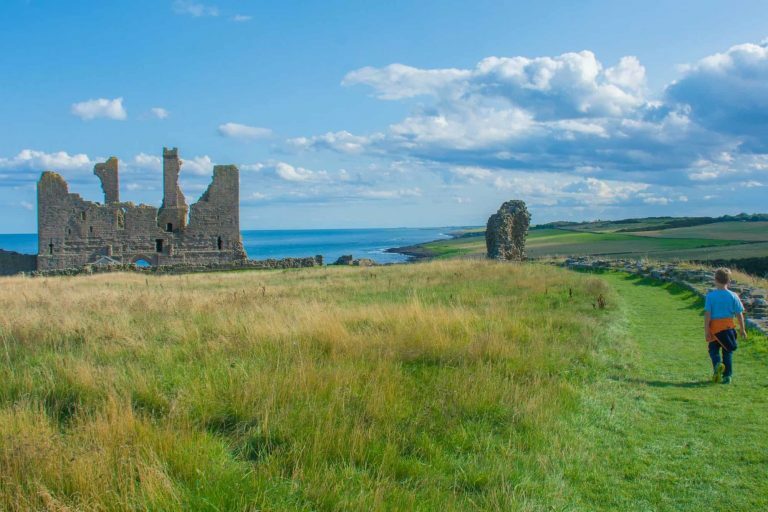 The walk is a pleasant one along the rocky Northumberland coastline through pastures of grazing sheep. The hill top castle looks far off in the distance at first, but the walk is surprisingly quick on a nice sunny day. At the castle, families can pay a fee to visit this English Heritage site and then go inside and explore the ruins. Planning a road trip in the UK? You might want to consider buying a family pass to English Heritage sites. The Dunstanburgh Castle is much more scenic from the outside. However, we had walked a ways to get there and curiosity got the best of me; I just had to go inside. It is fun to climb up into one of the towers and explore the ruins. 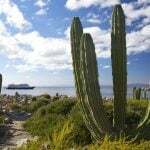 It is also possible to walk through a field to the ruins on the opposite side from the seashore for a view facing up the coast from the castle. I was glad that we did this late in the day on a sunny day. It was one of the most beautiful castles we saw on our England trip. The light on this Northumberland castle and coastline were lovely just a few hours from sunset. We spent the night at The Cobbled Yard Hotel in Berwick-Upon-Tweed and the Hog’s Head Inn in Alnwick while in Northumberland, England on our UK road trip route. 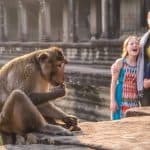 Both were fine choices for a family on a trip to England. The Cobbled Yard Hotel is more of a traditional British bed and breakfast. The Hog’s Head Inn in Alnwick is like a modern American hotel. Alnwick is a good home base if you’re looking to explore north east England while Berwick-Upon-Tweed is a bit closer to Scotland and would allow better for explorations in the direction of Edinburgh. 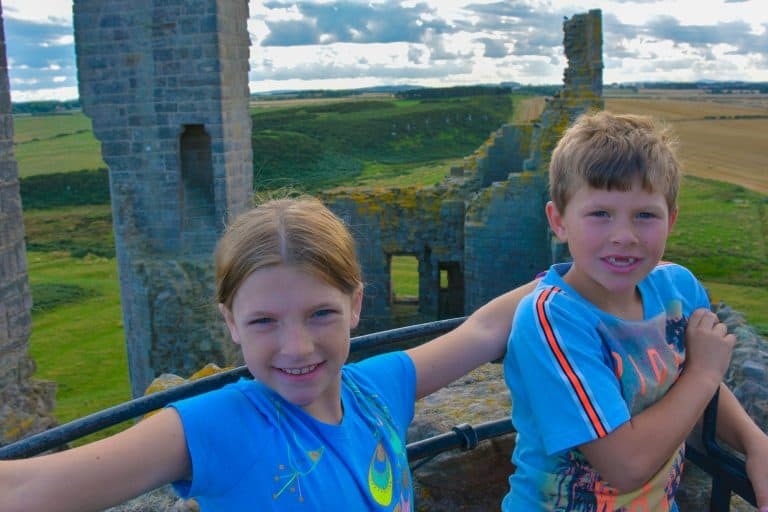 Check for deals at family-friendly hotels in Northumberland. It would be easy to spend several nights in Northumberland, England exploring both the coastline and making day trips into Scotland. Originally, I had hoped to take a day trip to Edinburgh. It would have been possible if there had there not been a festival going on at the time, making the city quite busy. I had also hoped to cross the causeway, open only at low tide, to spend some time exploring Holy Island and Lindisfarne Castle along the Northumberland Coast. However, as it turns out, heavy rain was forecast along the coastline for our day in this region. Thus, going to an island seemed like a miserable idea. Instead, being flexible with our UK road trip route, we decided to head inland to Kelso, Scotland where the weather forecast was not nearly as wet. We were fortunate in that we had a few hours to explore Floors Castle in Scotland before it began to rain. Even better, the day of our visit coincided with their annual bagpipe festival, Massed Pipe Band and Family Fun Day. There were dozens, if not hundreds of bagpipers, at Floors Castle the day of our visit. And, the Scottish were certainly not afraid of a bit of light rain. Admittedly, a day trip to Floors Castle would not have been so interesting if it had not been for the epic bagpipe procession that we were able to enjoy. Just after noon, we stood in light rain to witness a group of bagpipers piping traditional tunes in front of the castle. With a little luck, our day that was seemingly rained out became one of the most interesting cultural experiences of our trip to England. Floors Castle is occupied by a Duke’s family so the rooms that tourists can visit are limited. In fact, it is the largest occupied castle in Scotland. 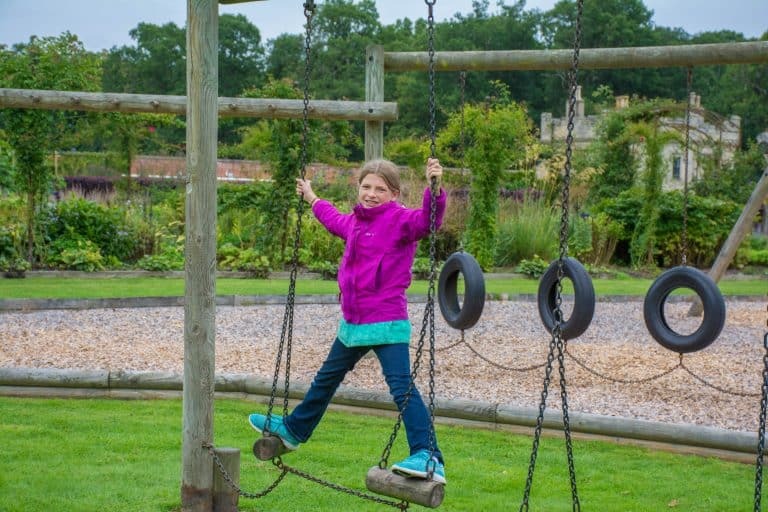 Our family found the grounds, including the playground in the walled garden, more impressive than the castle itself. With all the castles in the UK, I’m not sure that I’d recommend going out of your way to tour the inside of Floors Castle. It is possible to only purchase a grounds ticket for only the gardens at Floors Castle. A stop at the Terrace Cafe and walled gardens is certainly a fun way to spend an hour or two in the Scottish Borders with young children. We loved the tea shop, the cakes were amazing. Our sandwiches were tasty as well. Inside the walls of the garden are the Millennium Garden, the Walled Garden, and the Adventure Playground. Nearby in Kelso, we made a quick stop at the ruins of the Kelso Abbey. 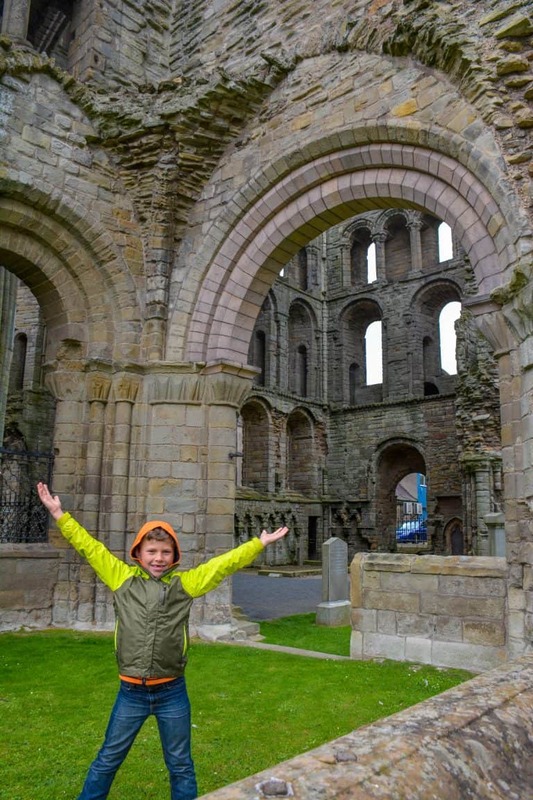 We also intended to visit the Jedburgh Abbey and walk around the town there. However, as we pulled into the parking lot outside of town, it began storming. We hopped back in our car in search of tea and scones. We stopped for tea at The Hirsel Cottage Tea Room in Coldstream. 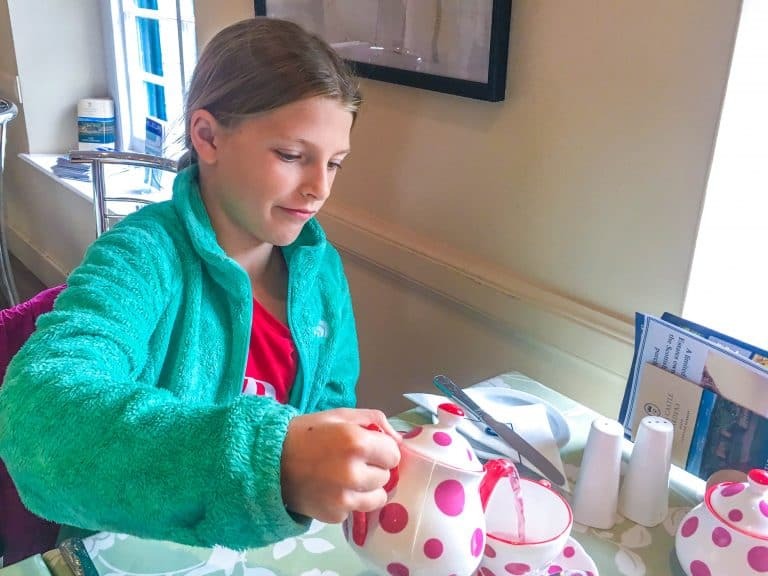 This tea room is in a park with a playground, lake, and trails for walking making it an ideal stop for families with young children on a UK road trip route. As expected, the visit to Alnwick Castle and Alnwick Gardens were one of the highlights of our UK road trip route for the kids. During British school holidays, Alnwick Castle in Northumberland, England can be quite busy. When planning your road trip in the UK, make sure to stay nearby so that you can arrive early at Alnwick Castle. Many tickets and tours are first come, first served. From the ticket booth, we walked quickly into Alnwick Castle to get free tickets for the Harry Potter-themed Broomstick Training Session and the Dragon Quest. 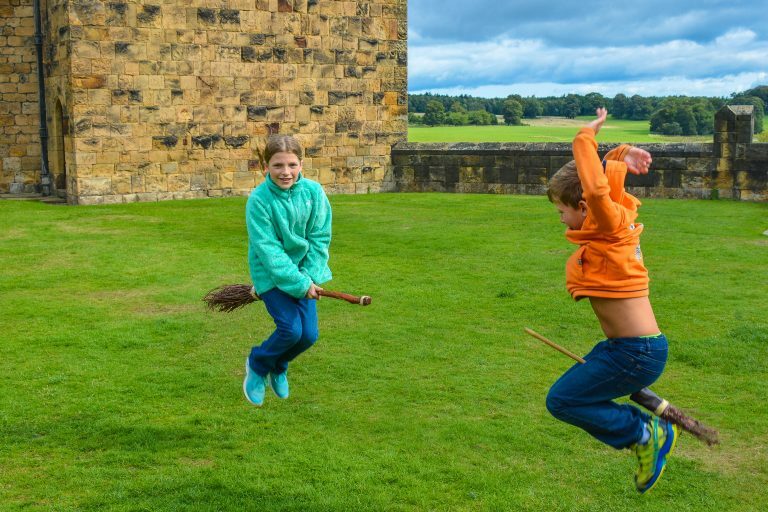 I highly recommend the Broomstick Training Session at Alnwick Castle. Both adults and children can participate. Think of the experience as a kid-friendly Harry Potter-themed interactive show centered around flying on a broomstick. 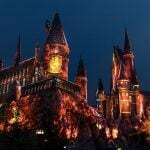 Adults and children alike scamper across the castle lawn with a broomstick between their legs as if they are flying guided by a few teachers dressed in robes. It is even more hilarious than it sounds. 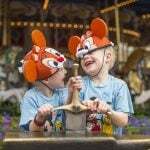 There is plenty to keep families busy at Alnwick Castle for a few hours. The Dragon Quest is a short, modern, walk-through experience that tells a story with lots of fun effects. In the Artisan’s Courtyard, there were lots of family-friendly activities, from guided soap-making to dress up for all ages. We also walked through the castle’s state rooms and watched a falconry show. These sorts of activities are available for families in castles all over England in the summer months. However, this was our first opportunity to catch a falconry show so my kids were super excited about it. 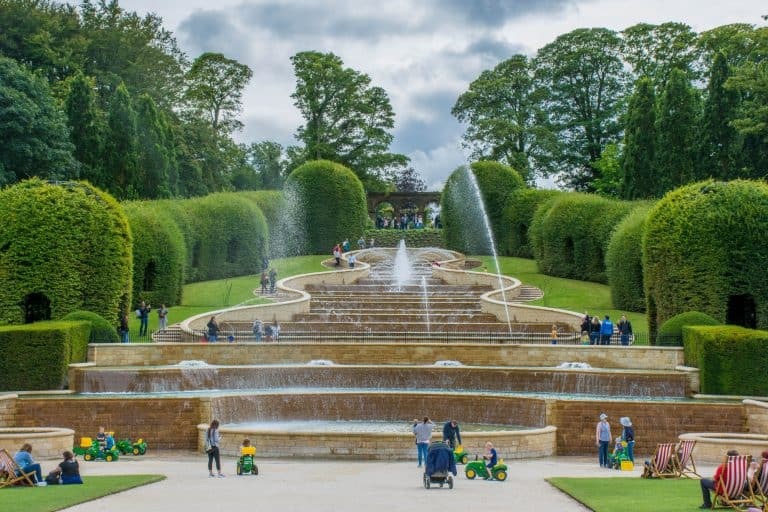 The Alnwick Gardens are even more magical for families. Upon entry to the gardens, we were given a scavenger hunt to find 8 things that Mr. Giant had left behind all over the gardens. The Grand Cascade tiered fountain is as spectacular as any fountain in Europe, and it’s quite a bit of fun as kids can find a few places on the path to get themselves sprayed with water if they choose. My favorite spot in the garden is the Cherry Orchard which features dozens of swinging benches. I can’t even imagine how beautiful it would be with all the trees in bloom. There was a huge line outside the famous Poison Garden so we didn’t wait for a tour. If you choose to prioritize Alnwick Garden over Alnwick Castle, be sure to head to the Poison Garden first for a tour. On the drive from Alnwick to the Lake District England, our family traveled alongside Hadrian’s Wall. We made one stop to learn about this World Heritage Site at Birdoswald Roman Fort. The Birdoswald Roman Fort has the longest stretch of Hadrian’s Wall still standing. It was quite difficult for us to identify which rock walls around the fort were part of Hadrian’s Wall and which were built centuries later. One of the highlights of a stop here is the interactive exhibits. Inside there are several exhibits that demonstrate how the fort was used and built. Outdoors among the ruins, there is a trail with kid-friendly activities and clues that guide families around the ruins explaining the use for each part of the fort. My family spent one full day in the Lake District, England on our UK road trip route. Families visiting the Lake District, England will want to make sure that they get out on the water at some point for a cruise around a lake. 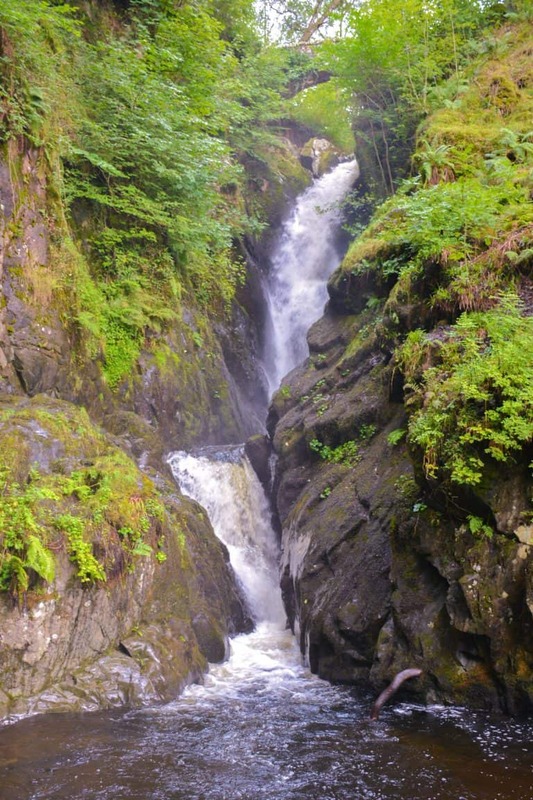 Hiking and enjoying the great outdoors should also be on every family’s list of things to do in the Lake District. Additionally, you’ll likely want to come inside and warm up with some tea if the weather in the Lake District, England is anything like it was the day of our visit. After sweating through a heatwave in London in early August. We were a bit disappointed by the chilly, wet, windy weather that we experienced during our day in the Lake District. However, it certainly gave us an authentic Lake District experience. It was so chilly that we opted to enjoy part of our cruise on Ullswater from the inside of the boat. We began our Ullswater Steamers cruise at the Pooley Bridge Pier House and got off at the Aira Force Pier. After a hike, we got back on the boat stopping again at Glenridding Pier House. Eventually, we caught the boat back to where we began, circling the entire lake. Do check the schedule before your adventure on Ullswater as not all boats stopped at the Aira Force Pier. I would have liked to hike more along the Ullswater Way on our England trip. The map that we received from Ullswater Steamers had trails and distances labeled between the various stops on the lake in the Lake District National Park. However, my kids vetoed a long hike so we only hiked the short 1 mile trail to the National Trust 65-foot waterfall at Aira Force. This popular path in the Lake District, England is well-marked and features several charming stone bridges. Past the parking lot, by the pier, there is a small café where families can have tea while children play on a nearby playground. A small snack bar is available on the boats. The day of our visit, the town of Glenridding was full of tourists and construction so we waited to eat lunch until we returned to Pooley Bridge. The views at Glenridding are beautiful, but it might not be worth getting off the boat unless you have good weather or specific plans. We had afternoon tea at Granny Dowbekins in Pooley Bridge. It was a perfect break from our gloomy day in the Lake District, England. After tea, we drove over to Keswick on Derwent Water. Again, we found lots of tourists, so we parked outside of town and took a walk around the lake. 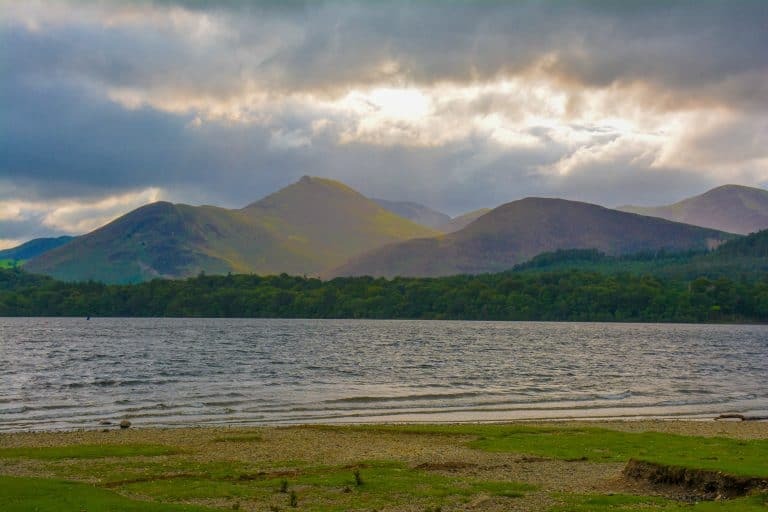 While planning our road trip in the UK, I had read that this is frequently named as one of the most scenic lakes in the Lake District, England. It certainly is a beautiful place to visit. It was simple to find a trail to walk along the lake shore. We enjoyed the views until we got chilly and decided to head back to our hotel. During our time in the Lake District, England, we stayed at the Roundthorn Country House in Penrith. It has easy access to the M6 in a country setting, and a yummy breakfast is served every morning. We could have spent several more days in the Lake District National Park exploring Lake Windermere and the Beatrix Potter attractions nearby. Our final full day on our UK road trip route was spent driving from the Lake District through the Cotswolds’. We spent the afternoon at Bourton-on-the-Water and followed it up with an evening in Chipping Campden. In Chipping Campden, we strolled around town past the historic Market Hall and down to the grounds of the St James’ church. Our family room at The Noel Arms Hotel even had a bunk bed for the kids. It was a nice way to end our trip to England. 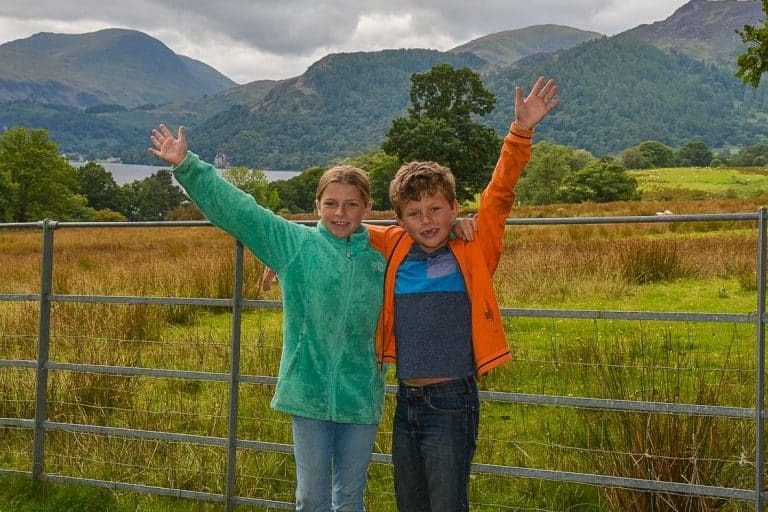 Look for deals on family-friendly hotels in the Lake District. Planning a road trip in the UK? 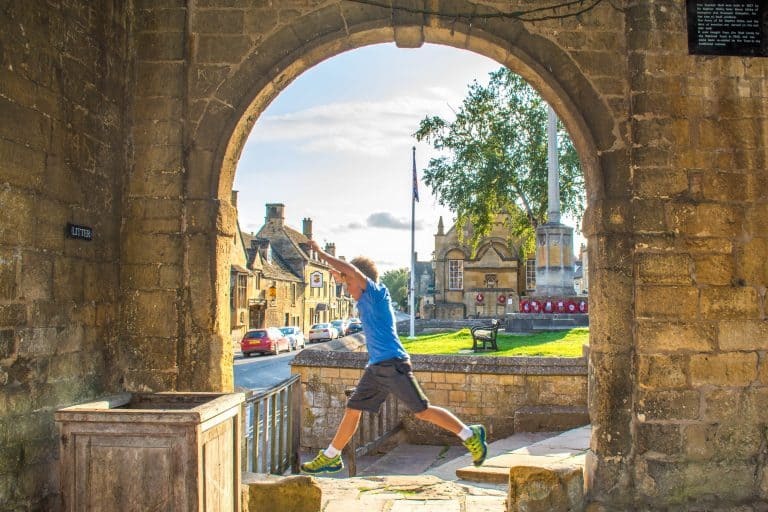 For more details about our visit to the Cotswolds’ and other day trips in England, check out our Day Trips from London for Families. Americans should not be afraid to rent a car and drive on the left side of the road when planning a road trip in the UK. On large highways, driving on the opposite side of the road is quite easy as the driver simply needs to follow the car in front of them. Personally, I found more congested areas are easier to navigate as cars are moving more slowly. In areas with more traffic, I could watch to see how cars in front of me turned and simply follow suit. With plenty of other cars driving in roundabouts, I barely noticed that I was going the opposite direction to that which I am accustomed. In my opinion, the trickiest part of driving on the left side of the road was the first few right-hand turns each day where there were no other cars to follow. We rented our car at London Heathrow, Prior to our UK road trip, we had visited South Africa where we had also rented a car. In my first few days of driving on the left-hand side of the road in South Africa, I did swipe my passenger side mirror against trees or shrubbery off to the side of the road on a few occasions. It’s probably good that we had zero deductible insurance. If you’re driving on the opposite side of the road, getting zero deductible insurance is likely a good investment as you won’t have to worry about any small scratches that you might incur from similar miscalculations while driving.